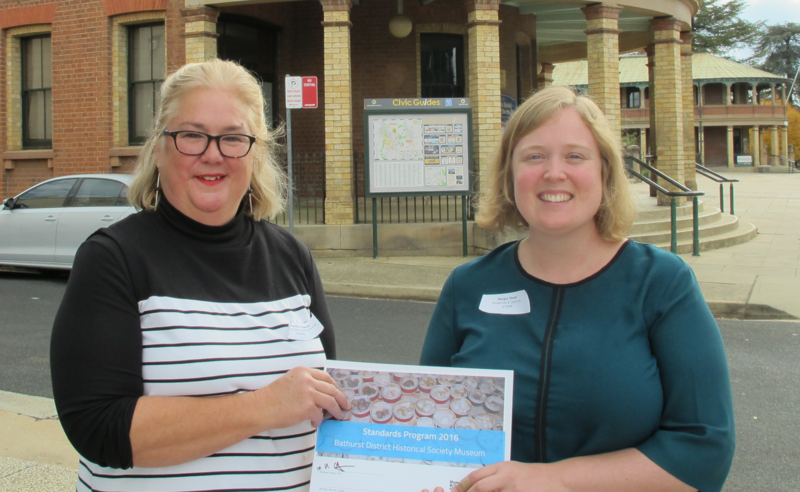 Margot Stuart (right) presents Samantha Friend, Bathurst District Historical Society Museum volunteer, with a certificate celebrating their participation in the Standards Program 2016. Last week we said farewell to Margot Stuart, who worked for just under four years as the Museum Programs and Collections Coordinator. In addition to administering the Volunteer Museum Grants Program, Margot coordinated the Standards Program and contributed generally to our internal strategic planning. She enjoyed visiting museums and talking to staff, paid and volunteers, about their stories, collections and concerns. She contributed a number of Fact Sheets about collections management and governance for the Resources section of our website. Her passionate support for the sector, professionalism and warm personality earned her respect and admiration from her colleagues and the many people who came in contact with her. Following a short break, Margot moves on to the role of Sector Development Officer in Transport Heritage NSW and while we’ll miss her greatly, we wish her well.